Oh man oh man. The wait is over!!! 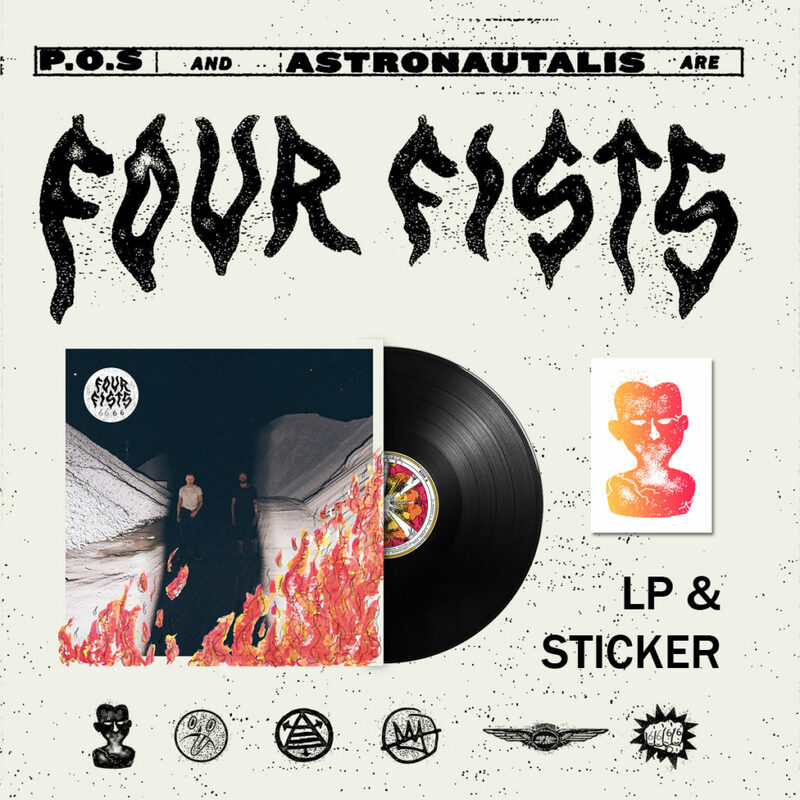 After five long years, P.O.S and Astronautalis have announced their debut full-length album as FOUR FISTS. 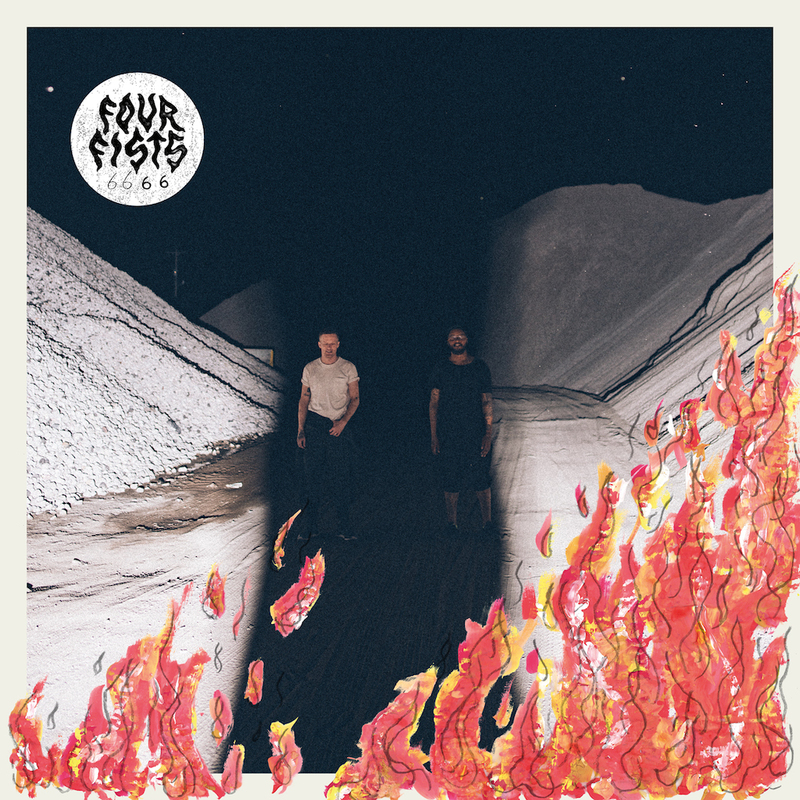 It’s called 6666 and it’s out on October 12th from Doomtree Records. YESSSSSS!!!! That’s the sweet album cover below. Shouts to Graham Tolbert on the photography and Andy McAlpine on all the design. 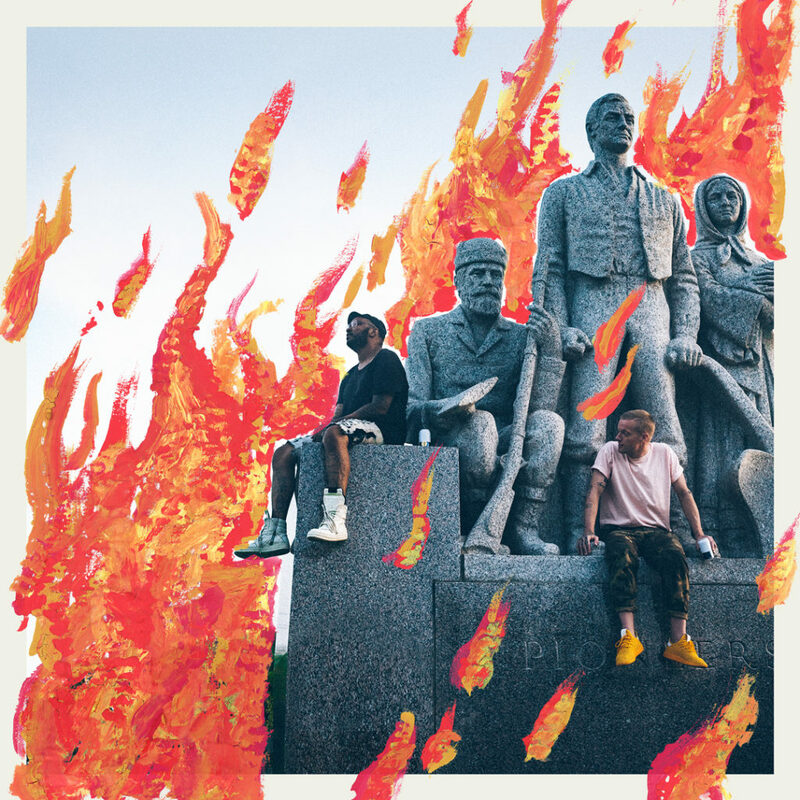 Last month the duo teased out singles “Nobody’s Biz” and “G.D.F.R,” and today they’ve let loose of a third 6666 track. This one is called “Dork Court” (in the running for best song title ever), and it is a certified HEAT KNOCKER. Shouts to Breakmaster Cylinder and Subp Yao on the beat. Check out the track below and spread the word! You can pre-order the album digitally and listen to these three singles on any of your favorite sites right HERE. OR…. 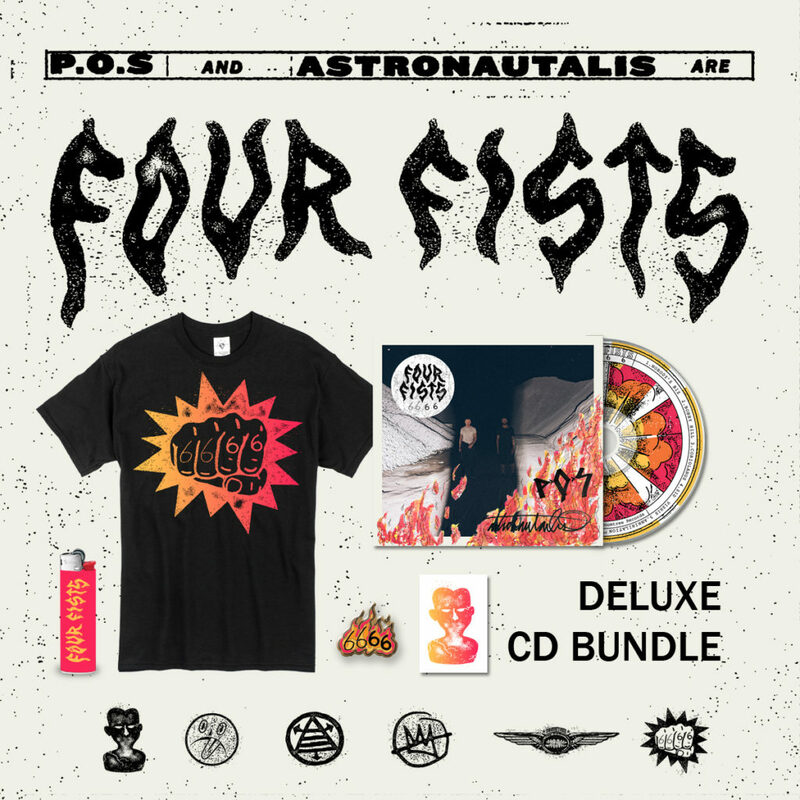 By now you probably know that any Doomtree Records release is going to come with an insane physical pre-order filled with all sorts of wild bonus items, and 6666 is no different. We’ve got three bonkers bundles for this album, starting with the ball-on-any-budget Standard Pre-Order, which includes immediate digital download of the three singles, a free sticker, and access to a Q&A live stream with Stef and Andy. Check this out. Now, for those of you into crazy exclusive merch, you gotta check out the Deluxe Pre-Order which comes with a limited-edition t-shirt, lighter, and custom enamel pin. So tight. 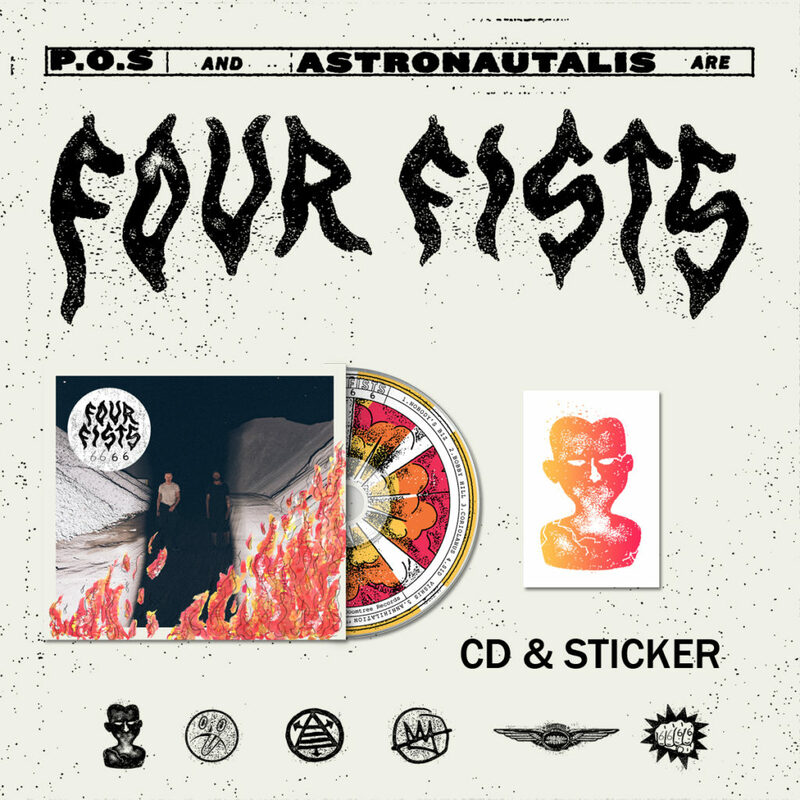 And for the ultimate die-hard P.O.S, Astronautalis, and Four Fists fan, we’ve got the Collector’s Pre-Order. We’re limiting this to 200 total bundles due to the extreme rareness of a few of the items. 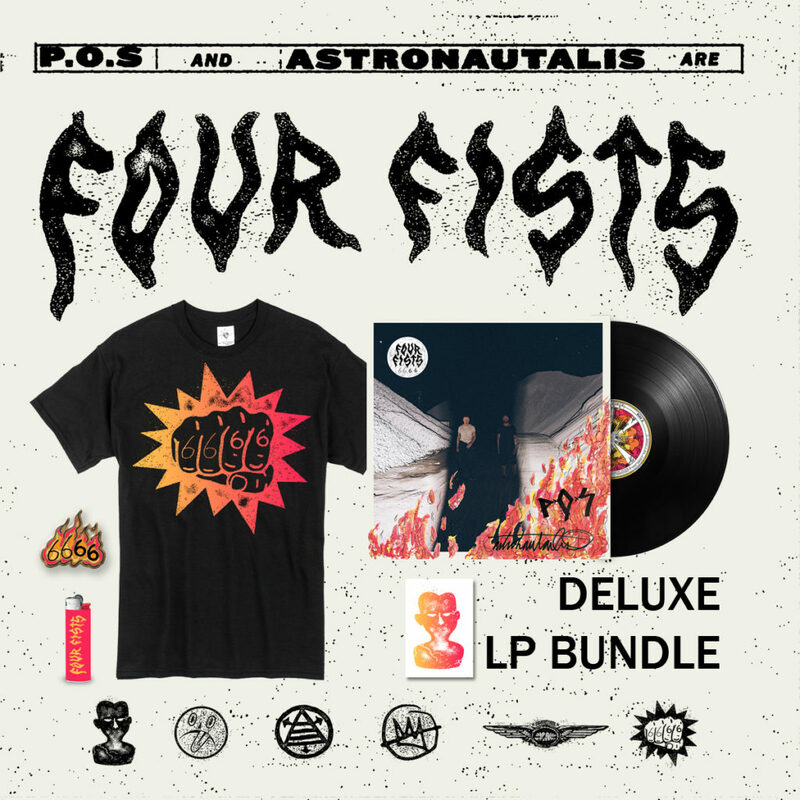 On top of everything in the Deluxe Pre-Order, you’ll also receive both the CD and LP, a Four Fists slipmat for your turntable, 7-Day Santeria candle, a handwritten postcard from P.O.S and Astronautalis, and an insanely limited edition screenprinted art poster – signed by Stef and Andy and numbered to 200. Check it! BLAMMO!!!! Go grab your favorite pre-order bundle at the Doomtree Webstore right HERE. 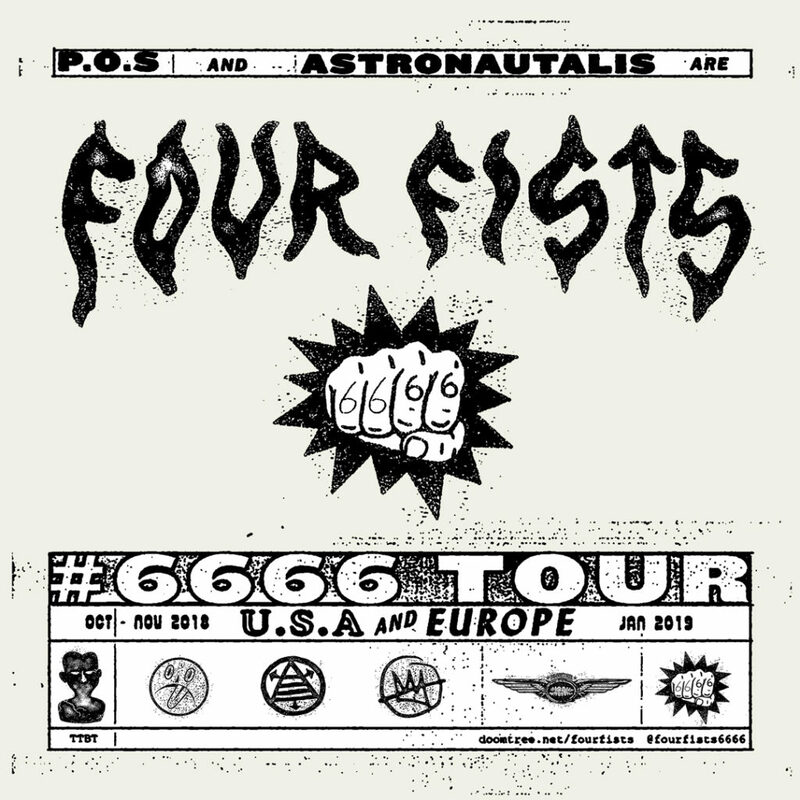 And on top of all of this incredible Four Fists news, the dudes have also announced an outrageous 6666 World Tour that they’re announcing today which will see P.O.S and Astronautalis running all over the US and Europe consistently until the end of January. 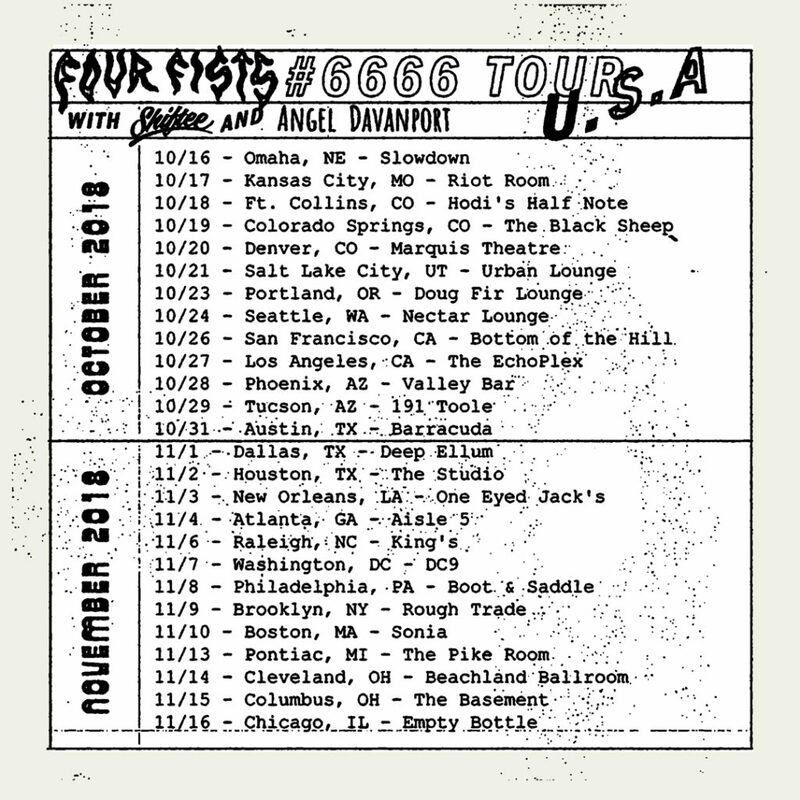 All dates are on sale right now and tickets can be purchased right HERE. BOOOOOOOOOM! Alright, I think that’s all the new announcements I can handle for this post. 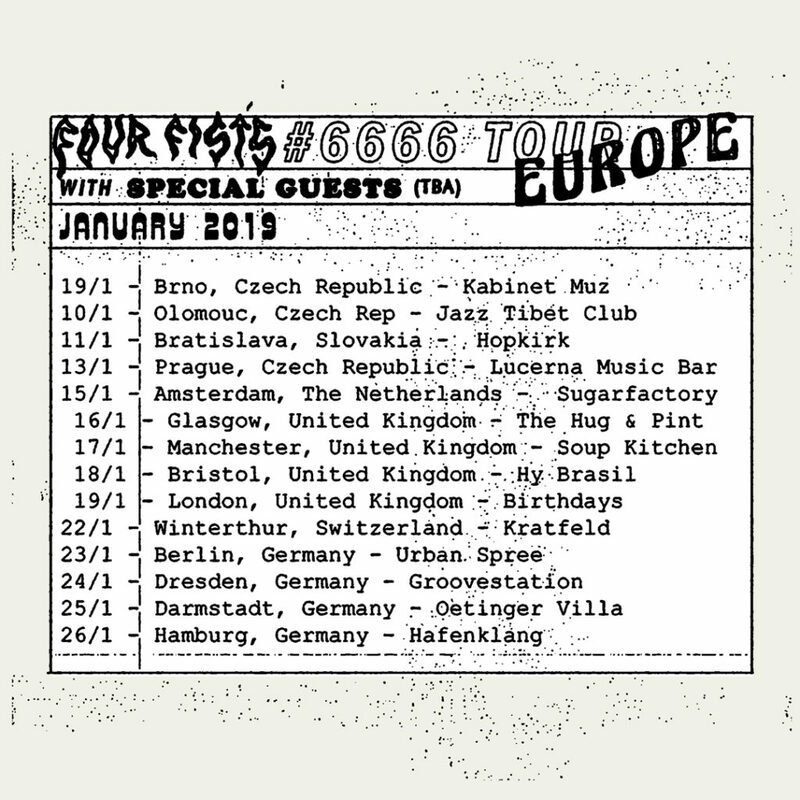 Make sure to bump that new Four Fists song and get amped for them to swing through a town near you. As always, thank you for all of your tremendous support. See you back here next week for another crazy round of Tuesdays With Lazerbeak. TTBT 4 LYFE!